UK-based PC Nextday makes a broad variety of machines, keeping costs down by using generic chassis designs for its laptops. The LogiQ 89-2411 is a feature-rich machine boasting impressive performance, although its slightly uninspiring style puts functionality firmly over form. The 15.4-inch screen is excellent and the sharp 1440 x 900-pixel resolution means images are crystal clear. Colour reproduction is excellent, with rich and vibrant colours. A glossy Super-TFT screen coating is in place, but doesn't prove too distracting in bright conditions. The use of a generic chassis means that PC Nextday can pass on savings - made by not developing their own chassis - to the customer. The chassis itself is a pearl white plastic which is suitably durable, and this laptop features a matt-black lid which isn't plagued by fingerprints and smears. The white keyboard provides a decent typing experience, although it gets dirty quite quickly. The keys are well spaced out, tapered and travel a comfortable distance. It is quite a noisy board, however, which may be important to those working regularly in a library, for example. The Intel Core 2 Duo processor is combined with 4096MB of memory to produce a good benchmarking performance. You'll have no problem concurrently running multiple applications such as web browsers and email clients. It's also possible to run more resource-intensive applications such as photo and video editing suites, which is ideal for multimedia fans. 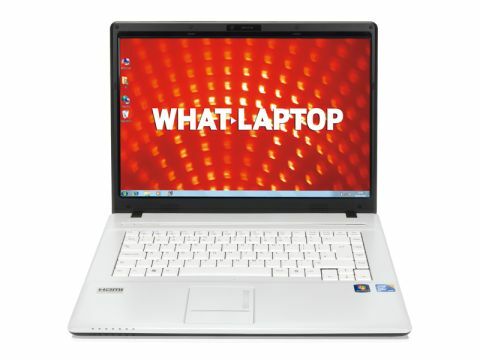 An entry-level dedicated nVidia graphics card enhances the laptop's multimedia capabilities, although the latest games will struggle to run. The 133-minute battery life isn't great and this laptop is better suited to home use as a result. The 2.7kg weight is actually quite light, however, and shouldn't prove a problem if you need to carry it around. This is the only laptop here to feature the older 802.11g Wi-Fi technology, and the 10/100 Ethernet isn't cutting-edge either. Three USB ports for peripherals is fairly standard and there's also an eSATA interface for transferring data at high speed to an external device. HDMI and VGA-out ports round out the specifications. The LogiQ 89-2411 is a decent machine with impressive performance and a broad range of features. The generic chassis won't appeal to everyone, but the money saved in employing it means that more powerful components can be employed at a competitive price.